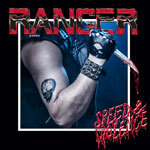 I really liked Ranger's debut record Where Evil Dwells , but I can't find the same attraction to the band's second effort Speed & Violence. What I saw last year as an energetic and fresh speed metal band has now disappeared to just being all too common. It's like they've lost part of their ability to come out with arresting music, because the songs aren't able to hit with the same striking accuracy once again. I think that the music kind of seems to be made by some veterans who have returned to the scene years and years later and can't quite bring forth all the necessary stuff that's essential when trying to put out a good record. The boys have definitely done their homework and they play as true and traditional speed metal as you possibly can this long after the style's origin long over 3 decades ago. Surely it's pretty much full speed ahead over the whole record and they give the listener only a few times to fully rest and as they proved with the last album, Ranger was in no way just a futile attempt to bring back the genre's so called heydays, but still, this isn't enough to convince me about a supposed greatness regarding this new record and no matter how many times I listen to the it, through headphones, speakers or in my car, things really never fall to place. The sound picture is, just as it maybe should be, a bit messy and grimy and indeed retro overall and, even if made with newer technique, a reminder of what a speed metal LP from 1983 or something sounds like. The drums typically follow the old prescription where they are a bit too loud in the mix and sometimes the guitar is too quiet in the crucial parts, where it could really enhance the full experience instead of just being around. The singer's voice derives from that bygone era too, which means somewhat shrill and squeaking, and if I didn't know better, it's like someone resurrected him from the kind of sleep that space travelers have in the movies just to get him in shape for this particular band. I shouldn't say that I can't enjoy anything on this album, but in the end I'm in fact a little disappointed over the outcome. I was expecting stuff that would be on par with the predecessor and after listening to this new record a couple of times I actually had to listen to the first record too, to see if it was just an infatuation, but it wasn't, so therefore I have now seen 2 different qualities of Ranger and drops 3 chalices in my rating from the first to the second effort.